Welcome to the Privacy Portal of Volkswagen AG. In the following section, you receive an overview of the data subject rights according to General Data Protection Regulation (GDPR) and how you can perceive your rights at Volkswagen AG. If you are a customer or interested party of Volkswagen AG, you can inform yourself about your rights in the following section. Please note that the information for employees and the respective form for sending an information request is currently only available in German. You want to send a request for information about your personal data to Volkswagen AG. Your personal information: First name, last name, date of birth, address and, if different from the address provided, a delivery address. If you request information about your personal data connected to a Volkswagen vehicle, you will also have to provide the Vehicle Identification Number (VIN) as well as proof of keepership. Once the identification is successfully completed, you will receive a postal reply from Volkswagen AG regarding your information request within a month. If processing your request is not possible within one month, you will be notified according to article 12 GDPR. A report containing your personal data as well as information regarding the processing of your personal data will be sent to you. You can also make use of further rights stated in GDPR, such as requesting a copy of your data. Please use the form attached to your information report or the webform to exercise your rights. Please always refer to any previous requests in order to enhance the processing time. The vehicle identification number (VIN) is an internationally standardized, 17 character identifier unique to any motor vehicle. This identifier is depicted in the registration certificate as well as in several places on each vehicle (common sites for this certificate are the engine compartment or behind the wind screen). Based on your VIN and keepership period, Volkswagen will provide you with the personal data related to your vehicle in your information report. We kindly ask you to only include vehicles manufactured by Volkswagen or Volkswagen commercial vehicles in your information request. The present illustrations are modified versions. The reference refers to the original document without redaction. 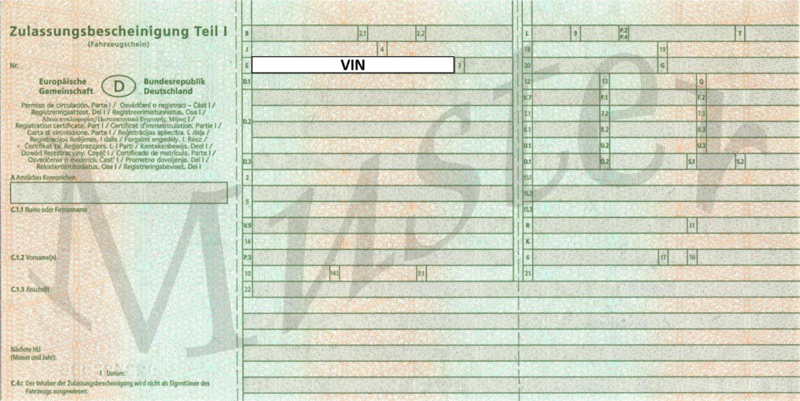 You will find the VIN of your vehicle in your registration certificate part 1 section E.
The specified keepership period is the time interval for which you want to receive information about your personal data which are associated with your VIN. For this keepership time frame, you must provide corresponding documentation. Insofar as both these pieces of documentation have not been issued in your name, we will require that you submit a Declaration of Consent from the vehicle keeper who is designated by name on the keepership verification documentation. The respective forms of consent can be found in the Download-Area. In accordance with the principle of data economy, we would like to point out to you that you may redact information on documents which we do not require for the processing of a transaction. Please refer to the Download-Area in the Information Sheet on the Redaction of Unrequired Data on Verification Documents for information on what you can make unrecognisable. You can request access to your personal data linked with your central Volkswagen ID user account, including the associated digital services (e.g. We Park, Volkswagen Connect), by stating your Volkswagen ID in our web form for information request (datenschutz.volkswagen.de/auskunftsanfrage). In our web form for information request (datenschutz.volkswagen.de/auskunftsanfrage) you can obtain information on your personal data stored in the central Volkswagen ID user account, including the associated digital services (e.g. We Park, Volkswagen Connect), by stating your Volkswagen ID in accordance with Art.15 GDPR. For this we need the e-mail address you have entered use as your Volkswagen ID. It will be used for a double opt-in procedure: an e-mail will be sent to the specified e-mail address with a request for confirmation. In this case your request will only be processed once you have selected clicked on the corresponding confirmation link. Please note that the link expires after 48 hours. In the event of a missing confirmation, the Volkswagen ID will not be used to determine indentify your personal data. If you want to enter several Volkswagen IDs, please make another file a request for information each Volkswagen ID. You shall have the right to demand that we correct your personal data, which are incorrect and/or incomplete. We recommend you to make a request to exercise your right of correction after having received information about your personal data. In this case, please use the contact data below for the correction request with your request and the transaction number from the previous information request. If you do not make a previous request for information, please describe your request for correction, stating your details (at least: first name, surname, address, date of birth) to the contact details below. You shall have the right, in the event that the requirements specified in Art. 17 GDPR have been met, to demand the erasure of your data. This is, for example, the case if the data is no longer required for the purpose for which it was originally collected. Additionally, you may request erasure, if the processing is based upon the consent which you have granted and you then withdraw this consent. You can exercise your right to erasure after receiving the requested information through the portal on further rights. Please keep the transaction ID of your previous request at hand. You can find this number in the information report you previously received from us. You shall have the right to demand the restriction of the processing if the requirements specified in Art. 18 GDPR have been met. This is, for example, the case if you dispute the correctness of your personal data. For the duration of the verification of the correctness of the, you may demand the restriction of the processing. Insofar as the processing is undertaken based upon an overriding interest or your data are used for the purposes of direct advertising, you shall have the right to object to the processing of your data. An objection shall be permissible pursuant to Art. 21 GDPR if the processing either is carried out in the public interest or in the exercising of official authority or owing to a justified interest of Volkswagen AG or of a third party. In the event that you object, we request that you state your reasons to us regarding why you are objecting to the data processing. In addition, you shall have the right to object to the data processing for the purposes of direct advertising. This shall also be valid for profiling insofar as this is undertaken in conjunction with the direct advertising. Insofar as the data processing is undertaken based upon a consent or a fulfilment of a contractual agreement and this is also undertaken while using an automated processing system, you shall have the right, pursuant to Art. 20 GDPR, to receive your data in a structured, commonplace and machine-readable format and to transfer these data to another data processing service provider. If our data processing is based on your consent, you have the right to withdraw that consent anytime using privacy@volkswagen.de. You shall also have the right to complain to a government supervisory authority (e.g. to the State Data Protection Officer for Lower Saxony, Germany) regarding our processing of your data.